Had enough free time today to get up to the Studio. Since it was such a nice day, before doing anything else, I took a stroll over to Cookman Ave in Asbury Park. Since the demise of Landmark Books in Manasquan, I haven't got a local outlet for my art, and I'd like to change that. Most of the galleries in this region focus on the beach scenes, flowers, and general over the couch art, or are more devoted to the framing business than promoting art. One place where I'm more likely to find galleries that are willing to handle stuff like I do is Asbury. I didn't do anything specifically yet, just looking around. Back in the Studio itself, I started by doing a little grading of student work. Normally I do that at home, but with my brother and his stuff and his cats staying with me for a few weeks, I decided to take advantage of the space to spread out all the large work. But most of the time was spent continuing to work on my notes for the next big project, the one relating to that Tower of Babel painting. (By the way, I brought back some sample vintage Erector Set parts from Bloomfield this week, to be another possible reference for it.) I'm getting a clearer image in my head of what I want. Within a few weeks I may be ready to start sketching. I'll post the full story at that point. Just as I was about to leave, Molly came by for a few minutes. We talked about the new rent (no word yet) and her own interest in finding an Asbury gallery. (the place that was selling her stuff is also out of business) She mentioned a contact at one place, and will let me know if anything comes of it. This week's edition of the local weekly had a big story on the front page- a dead body was found in a car parked in a supermarket parking lot in nearby Wall earlier this week. It was a guy from Belleville, about a hour north of here. Here's where it gets odd. The guy was in the passenger seat, so not likely the driver. (definitely not his car) The autopsy indicated no obvious trauma, but did find that the body had been dead in the car for 4 days. A witness claims the car was there at least 2 days, so either it was not noticed earlier, or was driven there days after the passenger died. Toxicology report is pending. You would think this would be a good subject for another supermaket print, but there's a problem- I did a print about a very similar occurence that happened at another store in the same supermarket chain at the other end of Wall several years ago. Is this a trend? In the earlier case, the deceased had OD'd, and his host at the time of death thought it a good idea to get the body out of his house, so the dead man was put in the passenger seat of his own car, and it was driven to that parking lot. The print that came out of it is shown above, Scenes From the Grand Opening #12. My take on it was one of the "what if?" 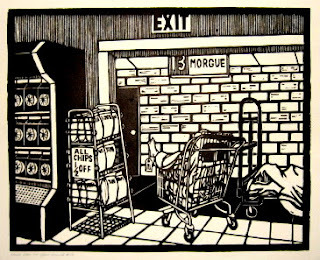 prints in the series, that if people are delivering dead bodies to supermarkets, perhaps the supermarket should have a morgue department. Thus, aisle 13, with one draped body stuffed in a shopping cart, another on a hand truck. So for me to use this new story for another print, I'd have to come up with a significantly different idea. At the very least, I should wait until the investigation is done, as some other details about the incident may provide the inspiration. I was beginning to wonder about the Hunterdon Juried Show that I submitted work to back in March. Notices were to go out a week ago, but days passed with no notification. There were a number of possibilities to explain this. Sometimes the juror has to postpone for illness or something. The major storm last week could have caused problems, as the museum is a former 19th century mill building sitting right on a river, and rivers all over the north east were flooding for days. Another possibility was that sometimes galleries send the acceptance letters out first, then get around the the rejections later. I don't know if either of the first two happened, but when the return envelope finally arrived today, I was hit with the third. I'm a bit mystified here- hard to believe that a print that was considered the best work of art out of over 150 entries in Belmar last month wasn't considered at least in the top several dozen or so that made the cut. And the other two were pretty good prints, too. Well, at least this saves me from making multiple trips all the way up to Clinton for drop off/reception/pick up. As for the future, the new regime is picking terrible jurors, so I'll skip this show from now on unless they bring in a juror I know will give me a fair shot. And speaking of jurors, yesterday my mail included the prospectus for the next juried show at PCNJ, the latest Small Impressions show, which is being juried by Nancy Einreinhofer from the Ben Shahn Galleries at William Paterson University. She's on my good list- I was included in the first 5 juried print shows in her space, including winning 2 purchase awards, before a juror finally left me out last year. 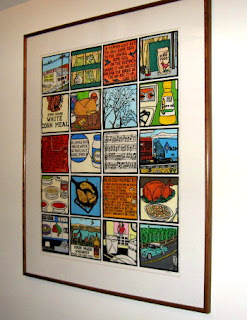 In addition, she pushed me to submit some slides when she was curating a book arts show in 2002, even though it's not really my speciality, and ended up making me one of the four specially featured artists, giving me a whole wall to show 18 Ecclesiastes prints. Jurying is typically blind, so it's not like my name on an entry would help me in this case, but she is predisposed to like my work, so I would think there's a good chance that as a juror she would select my work. The problem is that I don't do many small prints. At the moment I have one eligible piece, and I don't know if I'd do anymore before the deadline on June 3. The prospectus is available to download on the home page of the PCNJ website. Last Monday I drove to school through a wintery mix despite a declared state of emergency, to find a handful of students that had survived the floods. Today we had practically a summer day, which can often have the same effect on attendance. But actually I had the majority of students show up today, and most of those were prepared to print their collographs, so we did that. More exciting was that the new slides I had the department make for me are finally in. I had put in the request almost 2 months ago, leaving them a pile of my books to shoot from. We have a pretty decent slide library there, but there are always a few holes in any collection, and now I've filled some that matter to me. Some shots of the 1920's Germans like Dix and Grosz (we always had some, but now we have more), several from Masereel (they had none), a nice assortment of Die Brucke era black and white woodcuts, and some contemporary stuff. Between spring break, a change of student staff, and the rapidly disappearing options for slide developing, things took longer than expected. But they are in now and I had a chance to take a peek after class. The new photographer varied the exposures, but there enough good ones of everything to be of use. I left everything behind for a few days so they can compare the exposure records to the results (and maybe shoot dupes if they weren't done already). With the semester pretty much over anyway, I'm not going to need them until the fall anyway. I made a lightning stop in the Studio this afternoon, a drop off/pick up deal. Had another such stop mid-week. And that's the closest I came to making art this week. It was another 7 days of working my 3 jobs, cooking, cleaning, and preparing for my brother's temporary move in with me. About all I had time for was taking more notes for the next big project. Sometimes I get an inspiration for a print, do a few sketches, get a block, and it's done. Sometimes it's a much longer process. Especially when it's a more complex concept. For example, my Birds and Seeds series (shown above) started with an inspiration in a sandwich shop on the strip in Carbondale in early 1995, took almost a year (with a move halfway across the country in between) to start making notes, and was only finished about another year after that. This latest idea has been in the notes stage for a few weeks. Jot down some ideas, do some free association and research, let it stew around in the brain a while. There is such a thing as overthinking it, but that point is still quite far away. Don't worry- I'll tell you all about it when time comes. One hold up is research. Source items/materials I'd like for reference do exist, but not around here, requiring an inconvenient trip at some point. So for now I'll keep adding to the notes and thinking about the thing I see in my head, so when it is time to sketch, the drawing will come quickly. Sorry it's been so quiet around here lately, but the first week back to work after spring break kept me from getting anywhere near the Studio. Today was my first visit there in a week, and that was mostly to print a few more student woodcut blocks that were turned in yesterday. In between I've kept busy. Went to the monthly members meeting of the Belmar Arts Council. We're still putting the final list together for the Process Exposed show at the Print Council, with Sandra Murchison and Sean Caulfield joining the group. And teaching sometimes involves things outside the 14 hours I'm in the classroom. Besides the usual prep stuff, this week I took care of a recommendation letter for a student seeking a scholarship and was in contact with various models filling the schedule for my Figure Drawing class. Took care of some Studio related stuff without actually going there. Molly called me with some less than happy news-- with our first year lease up, they're looking to raise our rent. Haven't heard the figure yet, but luckily it's expected to be only a small increment, still well within our budget. And I did get started on a new print project. While my students were busy with painting projects, I had a few minutes to consider upcoming prints. (The Studio is as much a state of mind as it is a place) Got an idea that seems promising, took some notes. Brought it along a little further in the Studio today. Once I was done with printing those few student blocks, I was able to devote a bit more attention to the idea. 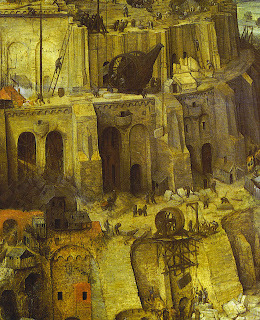 It's still too early to talk about it here, but part of my process was time spent looking at Bruegel's paintings of the Tower of Babel, a detail of which is shown above. This one is going to need a bit of time to develop in my head, so I may start a simpler project before this one reaches the drawing stage. As planned, I met up with new PCNJ director Elise Fuscarino at the Studio today around noon. 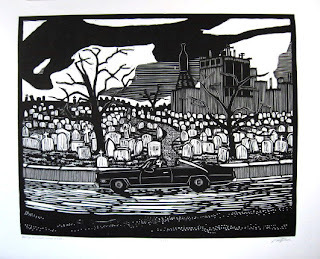 Shown above is the print I decided to donate- Death on the Highway. I chose it because it's a good print and I have a large edition of them. She seemed very impressed with it, but it still remains to be seen if anyone at the auction feels the same way. My work sometimes appeals to a very specific audience. As for this print, it has a back story. I went out to Evil Prints in St Louis in 2003, right around this time of year. Tom Huck flew me out, gave me a fold-out couch to sleep on, a fistfull of meal money, and dropped me off at the studio every morning. I had sent on ahead a blank piece of prepared wood and my tools, which arrived the same day I did. The idea I had was a combination of Albert Pinkham Ryder's The Race Track (aka Death on a Pale Horse) and a parcel of classic North Jersey landscape- a piece of the Garden State Parkway that passes through a sliver of Newark, and in doing so runs through a large cemetary, with the derelict remains of an old Pabst brewery and bottling plant looming overhead. The giant bottle had been a local landmark for almost a century (those not lucky enough to be from the Garden State may have seen it in an episode of The Sopranos a few seasons ago, when Uncle Junior is fixated on it while wandering Newark in an Alzheimer's fugue), but was finally taken down last year as the complex is due for redevelopment. I brought to St Louis a few action photos of the scene taken a few times I had occasion to drive by mile 145, as well as a book with Ryder's painting. My only other preparation was a few scribbles on looseleaf paper while waiting around in Newark Airport for my flight out. My first full day there I drew in the basic composition- the clouds are from Ryder's sky, as are the general shape of the horizon and the road, with the headstones, trees and plant reworked versions of the photos. In the original painting, Death rides a horse, but in my update a car would be required. I wanted a convertible, preferably 70's. Found a reference back at Huck's loft- a video still from the movie Casino. The next few days was a lot of cutting, with breaks once in a while as he brought me around to talk to his classes about my prints. Finished it before the weekend, then spent all day Saturday with his shop assistant as we cranked out the edition of 24. The next day (Easter) we saw the excellent Painted Prints show at SLAM, and signed/numbered the edition. I would have cooked a nice Italian feast for Tom as thanks for the great week, but we couldn't find a single open supermarket in the whole city. Monday I was on my way home, the prints arriving a few weeks later. There are tentative plans for me to produce a new print at Evil Prints in the summer of 2008. That gives me a year or so to come up with another good idea. Things have been kind of slow on the blog these last few days because I've been down with an early spring head cold that's kept me out of the Studio. My head's not even clear enough to give serious thought to the next project. But I did get one thing done today- finally got back to the Print Council regarding a message left on my phone this past Monday. I guess that auction is coming up soon and they want to know the dimensions of the print so they can secure mounting materials. Also, how the print is to get there- shipping, drop off, or pick up. Talked to the new director. Turns out that she's going to be in Belmar on Saturday, and used to live in Ocean Grove, so it will be easy for her to drop by the Studio that afternoon to pick up my donation. At least that got taken care of this week. Got up to the Studio in the afternoon for a few hours. I finished coloring the second copy of the new St Eustace print. Since it looks exactly like the first copy, no need to put up another photo, and if you want a reminder, you can see it here. Afterwards, I put away the paints and used the space and lack of distractions to grade the rest of the research papers I am planning to return to students tomorrow. In the evening I projected the new slides I picked up yesterday. Some were dupes of previously shot prints, so I had used the previously determined best exposure and those were fine. Others were new prints, so I bracketed exposures, based on a combination of light meter and best exposures of similar work. I got at least a few good slides of each new print, so it looks like it was a successful shoot.